A great film score can transform a movie. Just consider John Williams' triumphant opening fanfare for Star Wars or his dread-inducing string work on Jaws, or Danny Elfman's zany orchestral contributions to films such as Beetlejuice and Pee-wee's Big Adventure. 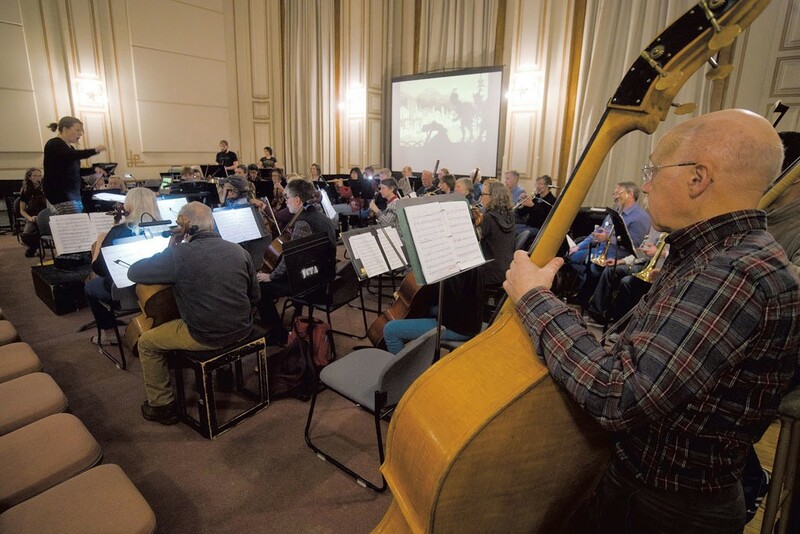 That music can underscore and heighten the action on the screen was especially true at the dawn of cinema, when silent films were often presented with musicians performing scores live in the theater. This weekend, the Montpelier Chamber Orchestra will perform new original scores to a trio of classic silent films as part of the annual Green Mountain Film Festival. The works were penned by locals, including professional composer Erik Nielsen and two student composers, Anna Halladay of Burlington and Drew Frankenberg of West Rutland. Titled New Music at the Movies, the concerts happen on Friday, March 22, at Essex Cinemas and Saturday, March 23, at College Hall Chapel, Vermont College of Fine Arts, in Montpelier. The project is a collaboration of the MCO, the GMFF and Music-COMP, a nonprofit music-mentoring program that works with student composers all over Vermont. The three-pronged endeavor is the brainchild of MCO music director and conductor Anne Decker. "I'm always looking for ways to make the concert music that I work with relevant to the community that we're in," says Decker, who cofounded TURNmusic, a chamber ensemble that specializes in contemporary music. "Who doesn't love movies?" she adds. Frankenberg, a homeschooled ninth grader, composed a new score to a section of Fritz Lang's 1927 sci-fi drama Metropolis. "The message of the film is pretty stark," says Decker. She adds that Frankenberg did a good job creating a minimalist sound to complement the movie's bleak aesthetic. "It's like worker bees," she says of Frankenberg's drone-heavy score for a scene that opens with workers trudging to their jobs underground. "I think that's just brilliant," Decker says, noting that members of the orchestra consider the piece tiring to perform. "He didn't just tie together the aural and visual experience; he created a similar experience, physically, for the players." "It took a lot of time and effort," says Frankenberg. "But it's a lot of fun composing for a film." The multi-instrumentalist credits his Music-COMP mentor, Matt LaRocca, with helping him navigate the composition process. "He was an amazing influence," says Frankenberg. Halladay, a senior at Burlington High School and cellist with the Vermont Youth Orchestra Association, composed for the 1907 short "La Glu," a comedy about a young boy and his sticky misadventures with glue. "It's supposed to be funny, so I wanted the mood to match what was going on in the film," says Halladay, explaining that she used a variety of compositional and articulation techniques to lighten up the piece. According to Decker, she succeeded. "It's just really comical," the conductor says of Halladay's score, which reminds her of circus music. "It's funny and lighthearted, which is exactly what the film is." Nielsen's commission, for acts IV and V of the 1926 animated fantasy film The Adventures of Prince Achmed, was supported by a grant from the Vermont Arts Council. "The music is very dramatic," says Decker of Nielsen's score, which, at 25 minutes, is the most substantial of the three pieces. "He has these big swells in moments that tie into the film, which are very stereotypical dramatic beats." "There's a fine balance between enhancing the action and working subliminally to let the audience know something is coming, and hitting them over the head with a sledgehammer," says Nielsen. "This is fairy tale, an adventure story," he continues. "It's got Aladdin and his magic lamp, flying horses, demons, and an evil magician. There's a lot of action, so I had to find fairly simple ways of highlighting it without getting too fancy." To do that, Nielsen says, he actively avoided listening to the film's original 1926 score. He also tried to acknowledge the story's cultural roots by employing Middle Eastern modes. "I'm trying to make music that sounds like it's of a place," Nielsen explains. "But I'm also trying to take cues from the action on the screen, so, if Achmed shoots an arrow, you get that, too." Writing for the MCO, he says, put an almost unlimited array of musical tools at his disposal. "When you're working with an orchestra, you've got a Rolls-Royce to work with," Nielsen says. This weekend and next, theaters in Essex Junction and Montpelier roll out the red carpet for the 22nd annual Green Mountain Film Festival. As always, the cinematic smorgasbord features a wide-ranging selection of narrative and documentary films from Vermont and around the globe. Below are seven highlights. Filmed at locations around northeastern Vermont, this film by New York City- and Barnard-based writer/director Josh Melrod centers on a troubled carpenter who returns to his rural hometown to build a log cabin and get his life back together. It stars Tara Summers ("Boston Legal") and first-time actor and native Vermonter Ujon Tokarski. This documentary from director Pamela B. Green tells the forgotten tale of Alice Guy-Blaché, a contemporary of Thomas Edison and the Lumière brothers who is widely regarded as the world's first female filmmaker. The sprawling film adaptation of Lithuanian-born French writer Romain Gary's autobiography follows his career in the French Air Force fighting the Nazis in World War II. But the crux of the film is Gary's unique relationship with his mother, played by Charlotte Gainsbourg, who propelled him to literary heights. When hunters searching for mammoth tusks in the New Siberian Islands discover a pristine mammoth carcass, they unwittingly change the world. This Russian documentary by directors Christian Frei and Maxim Arbugaev explores how the discovery led to a new and profound understanding of genetics and ushered in a technological revolution. Marcel Pagnol's warm, witty comedy concerns the marital foibles — and eventual scandal — of a small-town baker. A discussion of the 1938 classic with film historian Rick Winston follows. When Adam Gussow, a Jewish harmonica player, met a black Mississippi bluesman, Sterling "Mr. Satan" Magee, on the streets of Harlem in 1986, they began a musical collaboration that would propel them to international renown. But just as they rose to fame, Mr. Satan disappeared. Director V. Scott Balcerek chronicles their journey in this compelling and heartbreaking documentary. Nikolaus Leytner's World War II-era drama concerns the friendship between a 17-year-old tobacco shop apprentice and a rather famous customer, Sigmund Freud. Set in Vienna in the days before Adolf Hitler's takeover of the city, the film is both a coming-of-age story and an anxious portrait of pre-war Austria. 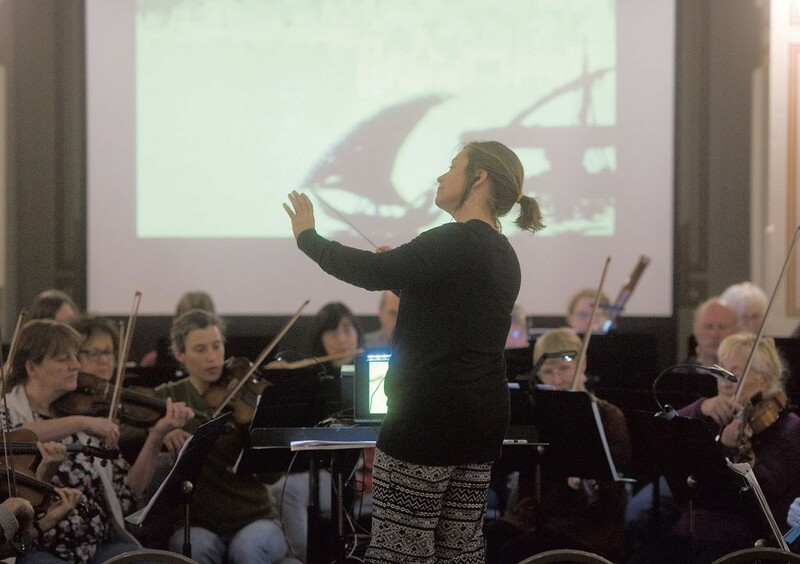 The original print version of this article was headlined "Montpelier Chamber Orchestra Premieres Original Film Scores at Green Mountain Film Festival"